Hope you all had a nice Thanksgiving weekend. We were on the other side of the state for a few days. I was able to visit with my siblings about the sequence of some these house-building details. I was pleased to know that I got most of them right. As I wrote two chapters back, for some reason Paul and I weren’t there during that phase of construction. I assumed that Dad would not have wanted the floor exposed to the weather that winter, but I forgot that the diagonal floorboards were laid that winter and covered it with Visqueen weighted down with bricks. Likewise, I said that we poured the cement basement floor in spring. I did not recall it, but I assumed that we had to pour the floor before we built the upstairs. However, my brother Paul pointed out that the reason I didn't remember the details was because I was gone for my freshman year of college when the basement floor was poured. He and Jack and some of my uncles were there to help, and the cement truck operator put his trough right through the window openings. They had to wheelbarrow cement to the back basement bedroom (which has only low, narrow windows). I may go back and correct those details, but I wanted to include these thoughts because sequential blips may be true of other portions of this story. I’ve done my best to be accurate in writing this account, but memory is a funny thing—especially after 35 years. The other reason I’ve added these thoughts is they underscore the narrative nature of family history. It is through the collective and connective retelling of family stories that the yarns of life remain knit when all else is unraveling. My daughter Kim was home from Chicago until yesterday. That was great. She told us about one of her students who has a thing for ceiling fans. He is four years old and talks out the side of his mouth. “I don’t know why I love ceiling fans, Miss Kim, but I do.” He often pulls her all around their school building by the hand, showing her the rooms that have ceiling fans, pointing them out with delight. "Let's not go down that hall... no ceiling fans down there." But the funniest thing was the day in late October when he ran up to her and said, “Hey. Guess what I’m going to be for Halloween? … A ceiling fan! My dad made me a ceiling fan costume!” It was so funny to hear Kim tell it, imitating the little kid's voice. She paused in thought, and in her eyes I could see the brief bewilderment that comes not so much with age but from the compression of time that makes decades seem like days. It was good to talk with her. 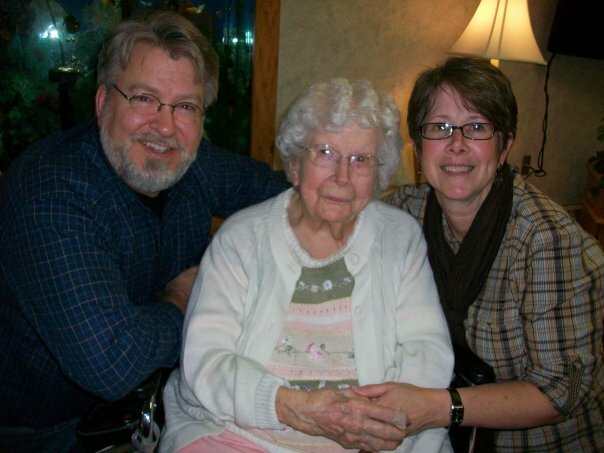 We spent about three hours there in the entertainment room of her nursing home. She was the only resident still up when we went back to her room at 10:30 PM. The nurses there have come to expect that of my Grandma. “She’s our night owl,” one of the nurses said as we helped her get ready for bed. Chapter 38-B “The Penny in the Wall” really is coming later this week. Unsettled Chapter 38-A "The Demand of Supply"
hMost homes are designed first and then the materials are purchased to meet the specifications. This was generally true of our house, but Dad had gathered many of his materials well before he was able to begin building the house. This delay allowed him to tweak some of his plans to meet the dimensions of his materials. It was a variation on the "Law of Supply and Demand." And here I’ll share an explanation for a noticeable feature in the design of the house: the bedroom hallway. By the standards of the late 20th Century, the bedrooms of our house are smaller than many homes built during those years. There are three reasons for this: First, bedrooms had been this size for centuries, and they were no smaller than the bedrooms of our Roseville house; second, Dad considered a bedroom to be simply that—a room with a bed in it. He did not see a need for family members isolating themselves in little “apartments” of their own. He and Mom wanted a cozy, inviting home with more emphasis on the common areas of the house where life was shared rather than the bedrooms where everyone separated at night; the third reason is perhaps the most amusing, but it is also very telling of how my father’s mind worked: the supply of materials demanded it. Several chapters back, I mentioned that Dad had agreed to haul off all the scrap materials from behind our church after the construction of the new sanctuary. Among those materials were two steel I-beams about twenty feet long. The placement of the brick wall in the basement was determined in part to accommodate the exact length of those beams without cutting them. Those beams from the church along with the length of the floor joists from the school dictated the placement of “support” walls, which in turn dictated the placement of the bedroom walls on the main floor. In this way, our home, when it was finished, reflected both the coziness Mom valued and the “no waste” mindset of my father. It did not occur to me until writing this chapter that Dad's unique "supply" of materials helped form the character of our house. Some of the house was built from a school, and three of the five children became teachers. Some of it was built from a church, and all of us have remained active in the church through the decades. And some of it was built of materials supplied from another source I have not yet mentioned, and this source represents the city where Dad worked most of his life. In the summer of '73, well before Dad had the cement block delivered for the basement walls. He was doing some field work for Bell along the Detroit River and saw these buildings being razed, he talked to one of the demolition contractors about purchasing some used brick and having it hauled to our property near 23 Mile Road. "How far is that?" the man asked. "Well, from the center of town here, it's about 23 miles plus a couple more once you get to 23 Mile Road." "I'm not sure right now. I'll need to do some math tonight. Can I take one of the bricks?" Dad asked. "Here's one on the house," he laughed. "I've got more than one company ready to take the whole lot of 'em, and once them other guys get 'em, the price'll be up to them, so don't take too long to decide. I'll hold what's here 'til tomorrow,"
Dad knew how these things worked. The brick was broken free from the building before the rest of the building came down in a pile of rubble. Front loaders scooped up the tons of brick to sort it for resale, and the companies that bought brick paid a lump sum for the whole mess. Only after brick was cleaned and sorted was it sold at a per-brick price, but Dad had no way of loading and hauling tons of brick, and he knew this was a very good deal. From the dimensions of that sample brick, Dad calculated how many it would take make the wall in the basement and the main level as well as the chimney that went up the wall and through the attic. He then calculated the area and bricks needed for the entire exterior of the house. The next day, he told the man how many bricks he needed. The man told Dad he'd throw in some extra to allow for breakage, and the next day five loads of brick were delivered to the site of our house. For a few hundred dollars, Dad would have all the brick his sons would ever want to clean. 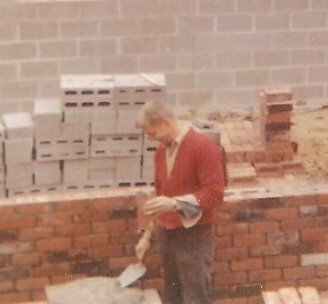 Dad had grown up in a house made of used brick, and our house on Atkins Road was made with nearly identical used brick. Today used brick is a "green idea," but Dad simply liked the look of it. He liked that it had absorbed the air of decades and taken on the tones of the seasons. 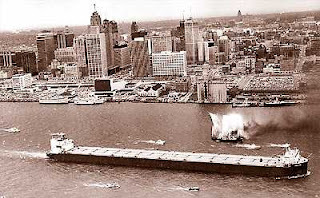 In this case, the brick patinia also held the sooty hues of smoke from passing ships, the Bob-Lo Boats, city busses, and when the wind was right, the Ford River Rouge Plant. Some of the brick bore layers of paint from huge display advertisements that had covered the marketable walls through the decades. A lot of history clings to the surface of old brick. It's beauty is enhanced by the imperfections of its fall to earth with the strength to serve in another wall for another hundred years. If you study this close up of a picture from Chapter 37, you'll see one pile of brick in the foreground. That is one truckload. In the background, you can see a cube of bricks 4x4x4. 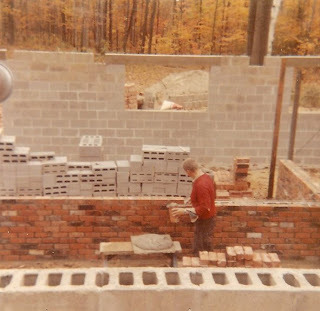 The afternoon the bricks were delivered, Dad and Dave and I began working on one pile, knocking the mortar off when needed, tossing the broken bricks and clumps of mortar into a "brickbat" pile, and putting the good brick into cubes. The sound of hammers chipping mortor from brick is a sort of gritty, chalky ring, but there is a knack and rhythm to tapping that is quite rewarding as grunt labor goes. It took two evenings to clean and cube and count one of the five loads, but it was an accurate way to know how many bricks were in each load. It is a very good thing we counted one load right away, because the deal Dad struck with the seller was for a certain number of bricks, and it turned out that each load had about 20% fewer bricks than the seller had promised. 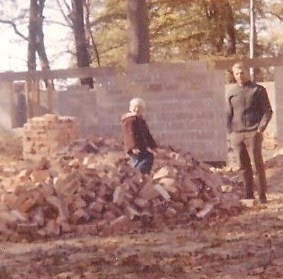 This was a problem, because Dad was very sure about how many brick we needed. The next day after work, Dad stopped by the site and explained the situation. As you can imagine, at first the man doubted that Dad had really taken the time to count bricks (he didn't know my dad), but having heard of our fast cleaning and cubing of the first load, he had no doubt we were correct and explained that the bricks were a half inch taller than standard bricks and that the amount he delivered should suffice. But Dad reminded him that he knew the bricks were larger and had calculated the number accordingly. The job could not be done with 20% fewer bricks. He also reminded him that the total he paid was a per-brick price. With no hard feelings on either side, the man simply agreed to deliver another load the next day. It's a bit too early to say this, because the house will not be finished for a few remaining chapters, but Dad's count was accuratet indeed. By the time all the masonry was done, he had just enough brick left to keep a few as tarp-weights after finishing the hearth in the upstairs living room. Chapter 38-B "The Penny in the Wall" after Thursday. Have a great week of giving thanks! Unsettled Chapter 37 "A Smile or a Sigh?" When Kathy, Paul, and Dave came home from college in May of ’73, they all found summer jobs within a week. Paul and Dave worked the midnight shift assembly line at the Pontiac GM Truck Plant. Kathy became a waitress at a little restaurant on Gratiot Avenue near Eastgate Shopping Center. Summer jobs were part of each kid’s deal with Dad and Mom to cover half of the college bills, but the various schedules of odd hours and overtime marked a distinct change in our home life. in cuts on calloused hands. of flesh against a bed. Somehow during that summer, I was also exempt from many Saturdays with Dad out at the property. I do not remember expressing an unwillingness to join him, but with each passing season it seemed that Dad understood the other dimensions of his son’s lives and in direct proportion grew more and more content to work alone. There were days when he would specifically ask for help from my friends and me, but the pattern of hearing the alarm go off Saturday mornings and dutifully rolling out of bed to join Dad became much less routine. I didn’t know it at the time, but Dad's days had also become less routine. Remember, one of his criteria for building the house was not to take out a mortgage or to incur debt in any way. That year he had been saving up to buy cement block and brick for the basement walls. 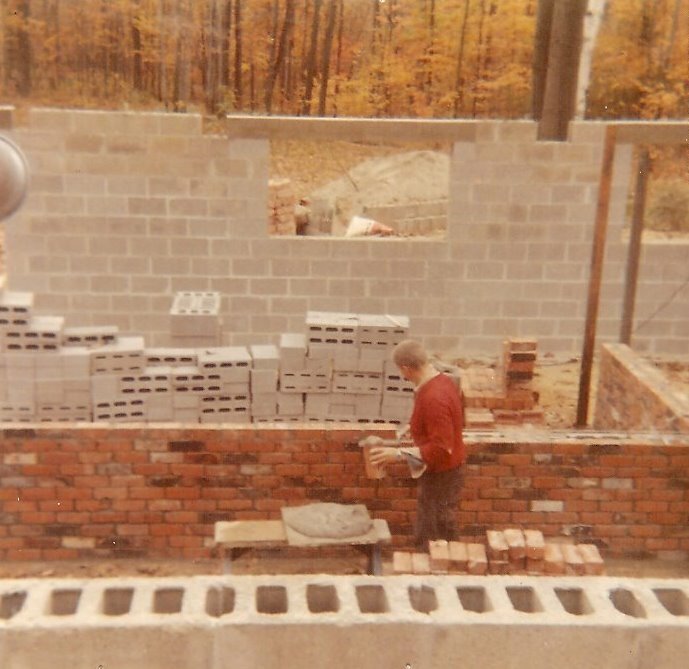 He had used the cement block from the school to build the front basement wall, beginning in the corner bedroom. In fact, to this day, you can see where he ran out of that block in the fruit celler below the porch. That narrow room has both the old and the new block, but until that load of new block was on hand, Dad's “to do” list was a bit more random and harder to explain to a son who may have other things to do himself. So Dad was content to putt around on Saturdays, completing the roads on the far side of the bridge, clearing out the creek with the back-hoe, or otherwise grooming the land into a place fit for long walks with him and Mom and Jimmy. I sometimes brought a friend out for walks in the woods—not the many guy friends who had joined me through the years—no, this was a girl friend, a nice young lady from my church (who is still a family friend to this day). I mention this only briefly here because it does, perhaps, explain why Dad was more understanding of my free time during my Junior and Senior Year. There was one job that Dave and I were assigned toward the end of the summer, and Paul and I continued it the next spring: cleaning used brick, but I'll talk more about that in a coming chapter. I’ve heard many people say they “built their own house.” By that they mean they served as their own general contractor but hired out much of the work, picking and choosing tasks they enjoyed or could do on their own to save money. In such cases a house goes up in a matter of months—two summers at the most—and the owner proudly oversees every phase. There is nothing wrong with that approach— in fact, I think it makes perfect sense—but that is not what Dad did. He had built two other houses in his younger years: one to sell and one for us to live in. He was a master at every trade involved: excavation, concrete work, masonry, plumbing, electrical, roughing in, finish work, cabinetry. There was no portion of our house that he did not intend to do himself. The excavation was done, the foundation laid, and the soil pipe in place just below the sandy soil. By late summer, Dad’s attention turned back to the house. It was time to build some walls. About the time Kathy and Dave were beginning to pack up for college (Paul chose not to return that fall), several pallets of cement block were delivered to the site. In a few weeks, I would be stepping into my senior year of high school. I don’t know where I was the day the block was delivered; I only know I wasn’t there to see whether it made Dad smile or sigh. I like to think he smiled as he is doing in these snapshots, but a secret sigh would have been understandable. After all, he was finally about to begin the house in earnest but may have realized that the last time he stood before this much cement block was sixteen years before on Atkins Road in Port Huron. He’d thought then that he was building the home in which we’d all grow up. Then came the transfer to Detroit, and we moved to Roseville with the plan to build again. Building was finally a reality, and that thought, no doubt, would have brought a smile. A sigh, if it happened, would have come with the thought that the years had slipped like sand through his fingers; three of his kids were grown and almost gone. Perhaps the house had been on hold too long to ever be a home for us all. Then again, there was Jimmy. There may have been no sighs at all. That may be my own temperament seeping into these thoughts as I write from an age ten years beyond Dad's at the time. I can truly say through all that yet remained ahead, Dad never seemed happier than when he was working on the house. So I'm thinking he smiled a lot the day the block was delivered. The abstract ideas in his head were about to become concrete... quite literally. No more long waits between the phases of construction. Time to "get the ball rollin'," as he used to say, but for some reason the first rolls of that ball were done alone. Paul and I were otherwise occupied during the months the lower walls went up. 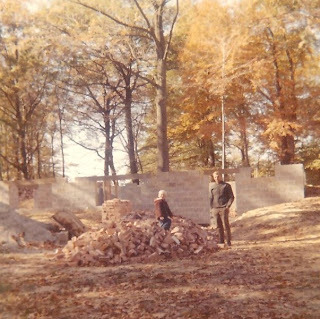 Were it not for these few pictures that Mom took in the fall of 1973, I would have no recollection of the basement taking shape. I only know that Dad's hands alone touched each of those bricks and that the last one was in place before the first freeze. Then the basement waited through the long winter for the floor below and above and for the framing of the house itself to begin. For that part of construction, my brother Paul and I were there to help. Unsettled Chapter 36 "Foreshadowed in the Soil"
The soil pipe from the old school was not stacked beside the barn but rather arranged side by side like dozens of pencils in a kitchen junk drawer. The summer months held the assortment in place with grass and weeds; autumn buried it in leaves that were pressed flat under the weight of winter snow. 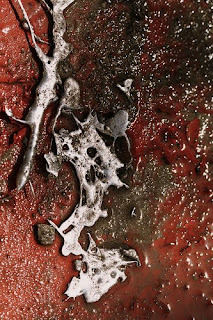 By the sunny days of spring, the pipes lie hidden beneath a mat of dried leaf-mâché in the shape of the iron beneath it. The matted leaves peeled off in sheets the day we lifted the pipes from where they’d settled slightly in the earth. Feeling their cold weight brought a vague sense of déjà vu. It had been over a year since that rainy night when Dave and Dad and I unloaded the pipes beside the barn. Now Dad and I were carrying them length by length from the barn to the foundation we had poured in the fall. Winter had brought no progress to the house, but Dad had high hopes for the five months ahead. 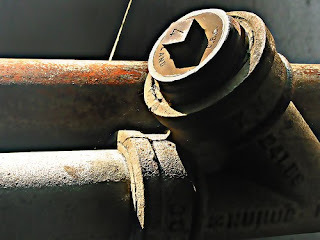 Inside that concrete border, beginning in the east corner, we laid the pipe out like giant Tinker Toys stretching to imaginary places, connected loosely with iron couplers of various shapes and angles. “What back door?” I asked. “Shower? There’s a shower in here.” I asked, surprised because it was not a very large space and our basement bathroom in Roseville had no shower. “Yep. Gotta have a shower down here. Right here in the corner.” Dad smiled as he pretended to step into a shower and demonstrate that there was ample room. I did not know it at the time, but the “Gotta have a shower down here” line foreshadowed plans Dad had not yet shared with the family. “Aren’t we going to use the lead we kept from the school?” I asked. The hardware store was a few miles east on 23 Mile Road. This was many years before national home improvement chains had sprung up in every market. There was no Home Depot or Lowes or Menards, just local hardware stores and lumberyards that were Dad’s favorite place to wander aisles. But on this day we did no wandering. We got the items on the list—threw in an extra bell-and-spigot reducer for good measure, and headed back to the site. Our first order of business was building a fire to melt the lead. In time, bon fires at fall and winter gatherings near the barn would became a tradition, but in the first several years of settling the land, the only fires we built were for burning stumps, brush, etc. Likewise, this day’s fire was for work, but it was not so much an open fire as it was a little foundry that Dad made out of old cement block and cast iron grates from the school. The grate was high enough to stoke several logs beneath it while holding a black kettle on top. The kettle looked like a small witch’s caldron especially as it began to melt the scraps of lead we dropped inside. 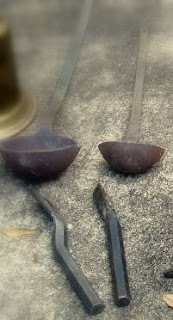 From a corner in the barn, Dad brought out an old wooden box full of tongs, and hand-hammered ladles, and chisel-like tools for tamping down the oakum. 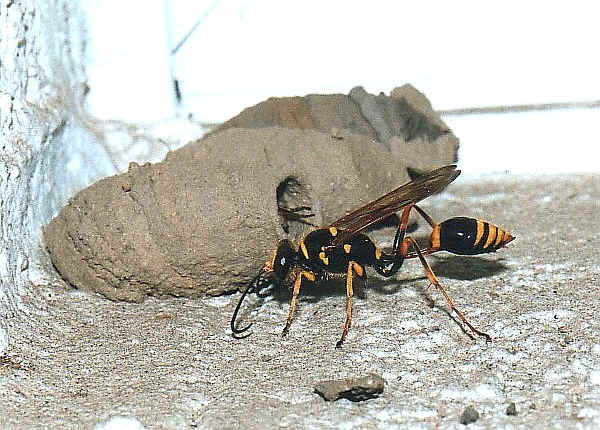 “It was tacked to a beam above the bottom step a few feet from the furnace in the basement.” I said. But Dad had drifted off in thought as he watched the lead melt in the kettle, and I drifted off, too. I began thinking about Grandma's basement where that picture hung and how scary it was to go down that old stairway. The soft wood of each step had been gently carved out by the traffic of half a century, worn round under foot the way an ox yoke shapes to the rhythm and friction of shoulder-hide. I remembered standing on the last step above which the picture was tacked. From there I’d study the dark recesses of that low-ceilinged space in the dim light of the one bare bulb that came on by the switch at the top of the stair. The other light bulbs had to be pulled 'on' by a string. There was only one reason I ever considered going downstairs by myself: the toilet in the corner. Being a plumber, Grandpa Collinge had added the luxury of a second stool in the basement when they built the place in 1910. This was not a bathroom, mind you; there was no wall or door--just an old toilet and wall-mount sink primarily for the men of the house (or for Grandma on laundry day if she didn’t want to run all the way up to the second floor). Sometimes if the upstairs bathroom was locked, we boys went down to use that corner toilet in the basement. But if I was alone, I’d stand there on that bottom step, trying to decide if I wanted to go further. The bare cement floor was swept clean but blackened by coal dust and the soles of Grandpa’s brogans through the years. That was why I knew that old photograph so well. It had sometimes given me the courage to step beyond it to that far corner with the white porcelain stool. As I grew older, I sometimes ventured into the other dark corners of that musty space. There was a coal bin beside the furnace, an old wash tub under the steps where Grandpa kept the gold fish from his garden pond through the winter; the name “Bud” carved into a floor joist (from my great Uncle, Grandma Spencer’s brother). I even remembered seeing some of these very tools on a bench along the far wall, but I didn’t know what they were. “I think that picture is still tacked to that beam,” Dad said. “Did you know that the symbol for lead on the periodic table of elements is Pb?” I asked. “I did not know that.” said Dad, “But it makes sense. See, you are learning something in Latin after all." "The Romans were known for their lead plumbing," I continued. "They used it make wine kettles and to run water to the rich people's houses. Mr. Young [my Latin teacher] says it was lead poisoning and sterility that prompted the fall of the Roman Empire." "Well I'll be. Never heard that before. But there's no need to worry about that here. This is all soil pipe. None of it supplies water, and besides the lead never touches the inside of this pipe. The oakum holds it back. The lead merely solders the fittings to hold them snug. In the hours to come, I learned the basics of a very old trade. We tapped oakum in the joints to seal the gap and stop the molten lead from going through. Waited the lead to cool and form a solid joint then move on to the next junction in the pipe that stretched across the sandy soil beneath what would someday be the basement floor. All the while we trenched out slightly more and more beneath the pipe to achieve the grade Dad had calculated to allow gravity and water to do their work. And with that, we had to carry the whole heavy configuration back to the fire to melt the joint and start that section over again, putting in the proper angle that allowed for perfect flow. We talked less the rest of that day. This was not a bad thing. There is a rhythm in work that sometimes needs no verbal cadence. But when Dad extended a piece of the new pipe from the middle of the center of the south-east wall back half-way toward the well, I had to ask him why. "This is for the kitchen sink,” he said. “It is. This is for the basement kitchen,” he smiled. Like the shower, this talk of a basement kitchen foreshadowed a chapter of our lives I did not yet comprehend. In fact, I gave it little thought. After all, what house couldn’t use a handy second kitchen for parties or a houseful of holiday company? As we finished up our work that day, there was nothing but a foundation and black cast-iron pipe laid out on the ground, but for the first time I could see the house Dad had drawn in his head: the corner bathroom, the laundry room, the kitchen, the drains, and all the stubs that would eventually reach upstairs to the plumbing above. But only Dad knew how much time would likely lapse before all this was done—only he understood why he was building two houses inside of one. August passed like the last inch of sand in an hour glass, faster, it seemed, than time itself. I did not hate school nor the thought of going back. What I dreaded was the end of things: the end of summer, the end of life as I knew it with Dave at home, the end and sharing the halls with him at school. Two years had passed since Kathy left for college; Paul had followed her the next year; and now, in the fall of 1972, Dave joined their ranks on the same far-away campus. The three of them would return home in December for Christmas, but until then, it was just Mom, Dad, Jimmy and me in the house on Buckhannon in Roseville. The house seemed empty. Along with the leaves, Mom's spirit always dropped in the fall (and typically didn't perk up until the first good snow). More than ever she was struggling with her private bouts of depression (that I would not know about for decades). On the surface, it seemed to be a typical case of empty nest that made her cling more tightly to Jim and me. Never was it more important that a little boy was a part of our lives. Jimmy was now four and long past needing a high chair. He sat to my left at breakfast and supper. For the first time as a family, we did not have to pull the table out to free up the chairs on the far side. Other than that, the morning routine stayed the same: hot cereal (on a plate so as not to burn our gullets); Dad would read a page of “Our Daily Bread” then hustle out the door to fight Detroit traffic en route to his Bell office downtown. Then Jimmy sat on the living room floor in his "robot" (that's what he called his robe) and watched “The Polka Dot Door” while I got dressed for school. To fully understand the pages of these days, it may help to know that, before finding the Youtube clip, I had not heard that song for 37 years, and that simple tune brought back those pleasant mornings and misted up my eyes as I smiled. You gotta be kiddin' me! Nope. It's true. I can get sentimental about the silliest things. It was the beginning of my junior year of high school. I would be taking Drivers Ed Class that winter (which used to be taught by the schools), but I would not get my license until a month before my 17th birthday. With Dave now gone, I was completely dependent on Mom for rides to and from the high school (about five miles from home). You recall from previous chapters that I was a late bloomer and wrestled in the 98-pound class the year as a sophomore...well, I now weighed only about 105 and stood 5'4". Add to that handicap the fact that sat and watched morning children's programs with my four-year-old brother while waiting for my Mom to pull on her least-ruined wig and get dressed enough to drive me to school. While my peers were jamming to Led Zeppelin and Iron Butterfly or mourning the break-up of the Beatles, I was singing “The Polka Dot Door” theme song with my little brother. I don’t know if it was because I had been the youngest child until Jim was born or because I was young for my age or because it was now just the two of us at home, but more and more of my “nothing to do” hours at home were spent with Jim. All the other patterns of life stayed pretty much the same. I was still active in the youth group at church, hung out with a handful of good friends at school, and worked with Dad nearly every Saturday out at the property. Saturday work was different, though. For one thing, we tended to get much later starts than when Dave was home. Sometimes it was after 9:00 when I was not hefting open the log gate to our driveway. Jimmy was old enough now to come with us sometimes—though never for the whole day. This was typically on days when Dad didn't really need me but did not want to break the pattern we'd been in for four years. 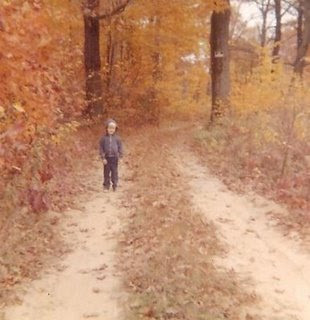 Jimmy and I would play in the woods or at the tree fort and rope swing, and Dad would call when he needed me to help. I’m not sure why, but Dad’s pace slowed down a bit. It was not age or health that caused it—goodness! He was only 42. But there was less urgency in our schedule once we met the deadline of tearing down the school. I think it was that “counting the cost” I mentioned before. With three kids in college, there was only so much he and Mom could afford to do on the house in any given month. We now had a good start on materials: We had the cement block for the basement (had to buy quite a bit more). We had enough soil pipe for all the ground-level work that had to be done before we poured the basement. We had enough lumber to frame in the forms for the foundation. None of these things would be harmed by sitting unfinished through the winter, but Dad wanted to hold off on framing in the house until spring when Paul and Dave would be home to help. Maybe that’s why the pace was slower. Maybe it was because Dad was taking more time to be a father to Jimmy than he had when the four of us were that age. It just so happened that I was Jimmy’s age when Dad began building their original dream house on Atkins Road, and believe me, Dad was all work and no play back then. It was Mom who tended to the four of us kids, keeping us out of Dad’s hair, while he was stirring up the saw dust. I don’t fault his ambition. His goal was to finish the house in which his family would grow up. But then we moved to Roseville. A dozen years flew by, and he was now getting ready to begin dream house two. Only problem was…three of the five kids were already out the door to college. Where did the time go? It’s frightening at times to calculate the years once you've passed mid-life. You shake your head and say, “That can’t be right," thinking you've made a math mistake. But then your head stops shaking, and it’s true. Dad was a different man at 42 than he was at 30. His priorities had changed, his faith had been awakened, and his family had grown—grown up and grown in number. And it was that fifth child who brought out the teacher in Dad. The father who had not taught his older sons how to tie a half-hitch until a moment of desperation was now taking his time to interact with Jim and me as we started what would be our final home. It was in these days I learned nearly everything I know about home construction. The first step was pouring the foundation. Dad had finished excavating out the hillside around the well in August. He surveyed the site, drove stakes and tied heavy twine in the shape of the house. Then everything was on hold as summer wrapped up and Kathy, Paul and Dave left for college. Once things settled down at home, we got back to work. We trenched and built most of the foundation forms for the outside rectangle of the house on one Saturday (thanks to all the advanced survey work). This was steady, serious work, and Jimmy stayed home with Mom until she brought out lunch around 2:00. The same was true the next week. We finished the inside forms (shaped like an "L") just as the air breaks hissed on the big cement truck that had woven its way into the woods. The truck backed up toward our empty forms, and the driver hopped from the cab to visit briefly with Dad. Cement truck drivers waste little time. They live in "dispatch" mode like mud-daubers delivering a product that has a short window of usefulness. Concrete prep-work is measured and methodical, but the actual pouring of cement is a hasty process punctuated with short confident commands by men who seem to know each other's next move. Me? I did not know the next move, and for a minute I just stood out of the way until Dad showed me what to do. 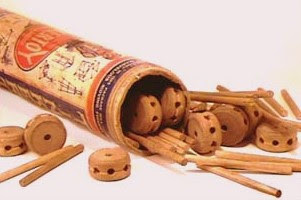 That’s when the fun began. I love the smell of wet cement. I like the gritty sound it makes as it slides down the heavy trough and plops against the ground…and the way it oozes into place with the help of a rake or shovel. I like the way it smoothes out under a wide trowel and seems to turn to rock right before your eyes. I hadn’t noticed in all the pouring and pulling of cement, but Mom and Jimmy had showed up with lunch, and from a safe distance they watched as we made our way around the base of the site. We didn’t stop to eat, until the truck drove away, and even then we ate while we worked. I was surprised by how quickly the first-poured cement began to set. It was not hardened, not cured—that would take weeks—but it was firm and immovable within a couple hours. In the last section we toweled, before the surface set, Dad took a twig and wrote our name and the date. It's all buried now and will never be seen, but that's how it is with foundations. They are the first formed and last remembered underpinnings of all things meant to last a lifetime. I've confessed that in the fall of '72 my morning sound track consisted of songs from my four-year-old brother's TV time, but my evenings were often spent down in Paul and Dave's bedroom in the basement listening to Paul’s Carpenter and Lettermen albums (which he did not take to college). It was a cheap little stereo, but Paul had bought it himself, and I passed countless hours down there on their beds staring up at the low ceiling until I knew every song by heart. At the risk of sounding corny and about ten years out of date for this chapter (but you must know by now that the music in our house was very conservative), let me close with one of the Lettermen songs I found myself playing often that September: Try to Remember. It's hard to believe that November is upon us. This has been a picturesque autumn, but as of this past weekend, nearly all of the trees in our area are bare. The oaks are holding on to half their inventory, but they always do, it seems, until Thanksgiving or so (or from the weight of the first snow). I took these pictures in our back yard in the summer of 2008 of a box turtle who lives there. I have not seen him since July, but he has gone and returned before. Even if I knew his exact whereabouts, I would not be seeing him for the next six months. The turtle in these pictures is technically called an "Eastern Ornate Box Turtle." He is larger and more orange than any of the dozens of others I've seen in the wild. There is a female nearly his size that is somewhere out there with him. Her coloring is much more muted, and she has almost no orange in her flesh, scales, or shell. I wish I had taken similar pictures of her when I last had the chance. I hope to see her again in the spring as well. Box turtles have been an interest of mine since the 1980s when I first became familiar with them in my wife’s home state of Kansas, where they are plentiful. I am less interested in fresh-water marine turtles, the painted turtles and sliders I see along creeks and rivers. They spend their winters underwater in the mud--with no access to air. This is remarkable considering they breath air the rest of the year. While snorkeling in Hawaii last February, I encounter some isolated sea turtles. Much like in a Jacques Cousteau documentary, one of these huge turtles allowed me to hold the sides of his shell as he pulled me along underwater. Sea turtles are powerful swimmers with the thrust to swim from human clasp (and some others did when I tried), but for some reason the one I bumped into first didn’t seem to mind towing me along until I had to let go and come up for air. That was very cool, but I know little about sea turtles. It’s box turtles with their fascinating mechanical shell and slow unthreatening ways that have held my attention through the years. You may be wondering: How can you tell the difference between male and female box turtles? It's quite easy if you know what to look for (and it’s not what you’re thinking). First, the eyes of the male are almost always red or deep orange. This is statistically possible of females but not typical. Second, the male turtle’s tail is wider and longer than the female’s (this is because it has a double purpose and houses necessary parts for breeding). And fourth: perhaps the most amazing part of the turtle design is the fact that the male plastron (the belly of his shell) is concave. It's hard to see it in this picture, but the shell actually goes in on the male and not on the female. Since I intended to focus more on hibernation not procreation, that’s probably enough on that subject. “Unsettled” Chapter 35: "The Foundation Was Poured in the Fall" will continue in the days ahead. Incidentally, in all the years we lived there, I never saw a single box turtle in our woods on the east side of the state.